Marconi's Reach is a high quality refurbishment of one of the cottages built for Marconi's engineers in 1920. This detached holiday home is on a private lane, just yards from the South West Coast Path and within easy reach of the sandy beach at Poldhu Cove. Short Breaks available, please select under 'Duration' on the search facility, or call 01326 240 333. Sleeping up to six in the three bedroom cottage with a large open-plan kitchen, dining and living area. The kitchen is fully furnished with all that the guests will need, including a microwave, oven, hob, American style fridge freezer, washing machine, tumble dryer and dishwasher. There is a dining area with table and chairs and a lounge area with comfortable seating, Smart TV & DVD player and Wifi is available throughout. 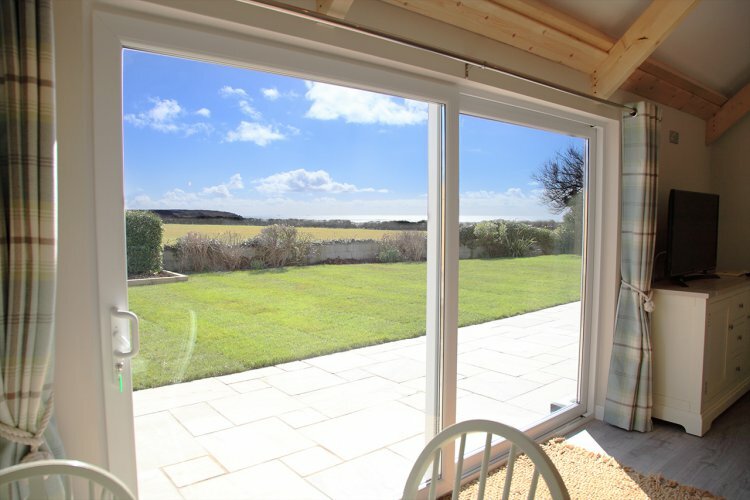 From this room you can look out across the garden, over the field beyond and out to sea. The main bedroom has a super king-size bed, en suite shower room, patio door leading onto the patio at the rear of the property and sea views. The second bedroom has a super king-size bed (can be separated to make twin beds), a patio door on to the patio and views of the garden at the rear of the property. The third bedroom is designed for children only with a set of bunk beds. It looks out to the front of the property. There is a family bathroom with both a shower and bath. There is a good size hallway at the front of the property, with hooks for coats and boot rack for wellies, it leads to all bedrooms, bathroom and living area. The garden surrounds three sides of the property. There is a small outhouse for safe storage of bicycles and surfboards in the back garden. The front drive has ample parking for two cars. The front garden has a lawn area and borders of plants. The rear garden has a large patio area and outside seating, with a large lawn, rotary washing line, borders of plants and views of the sea around Mullion Island. This is an animal free and smoking free property. The whole property is a detached bungalow on a quiet private lane on the outskirts of Mullion, with easy access to coastal walks and beaches. How would you like the second bedroom made up? Keep it as a king size double. Make it into twin single beds please.